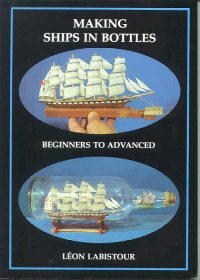 "The best beginners guide around"
This is the most straightforward introduction to making ships in bottles available. It is a most encouraging book designed to get a beginner going in the hobby - and adding material for the advanced modeler as confidence builds. The book combines Leon's technical expertise and draws on Pat's long experience both as a modeller and a teacher, to set out the work in stages - each easily followed. To read a full review or order a copy on-line or by post please click here. The Association welcomes bottle ship makers, collectors and indeed anyone interested in the art. Currently there are over 260 members drawn from right across Europe and around the world, several as far afield as Japan. Membership costs £16 pa in the UK and £18 for the rest of the world. (or £20 with Airmail). 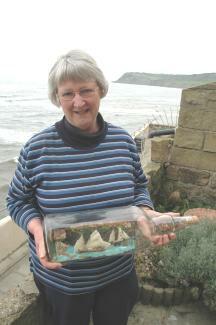 The Association publishes the informative quarterly magazine "Bottleship", and has a regular convention and prize giving. Patricia Labistour with one of her models.